Have you ever been so messed up that you’ve gone to an ATM, took out about $200, and rolled it up and ate it like a burrito? Me neither, yet, but 28-year-old Douglas Francisco came pretty close when he was found passed out in his Hyundai, blocking the drive-through lane of a Bank of America. 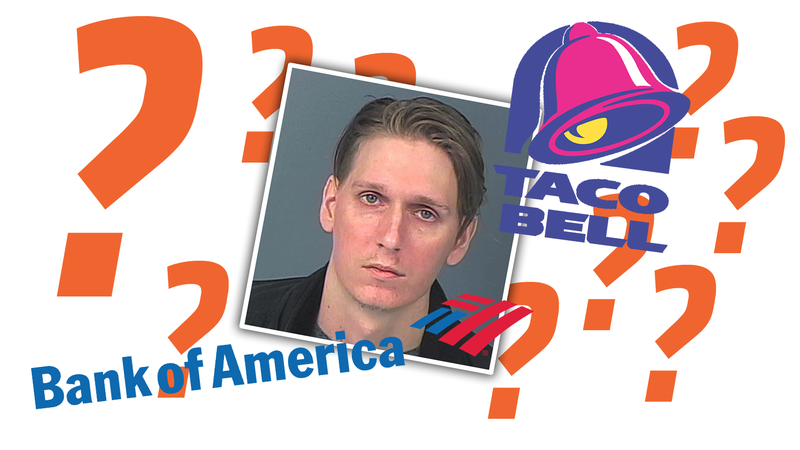 He tried to order a burrito, thinking the bank was a Taco Bell. The Spring Hill, Florida (duh) man proved very hard to awaken, with the bank manager pounding on the window for a good length of time before Francisco woke up and ordered a burrito from the bank manager. In a move all too indicative of the lack of true customer service at modern banks, the manager didn’t even try to make the man a burrito with whatever he could scrounge in the break room, but simply informed the man that he was at a bank, not a Taco Bell. Francisco then drove off, which was not a great idea, given his condition, but he didn’t get too far, with police finding him in the parking lot, with his Hyundai still running. When the police questioned him, deputies reported that he “made several statements that were differing with reality,” which isn’t shocking coming from someone who just tried to order a Burrito Supreme from Bank of America. Police found Oxycodone and Xanax on the driver, though both were prescribed to Francisco. Since he demonstrated signs of being under the influence of narcotics, he was charged with a DUI. This should be a wake-up call to Bank of America, who really should offer some sort of burrito options to their customers. It’d save a lot of time if you could just convert your money right into burritos at the ATM, and cut out the middleman. Do you want that $100 in $20s or burritos?